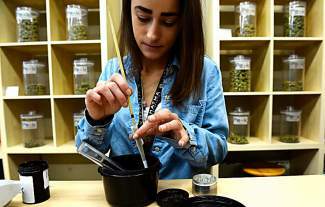 Budtender Heather Howell pours crushed marijuana into a cone it to make into marijuana joint at Peak Marijuana Dispensary at 260 Broadway in Denver, Colorado. From small towns that barely dot the map to the state’s largest urban areas, revenue from retail marijuana sales is helping communities address homelessness, send children to college, patch potholes, secure water rights and fund an array of projects. Aurora is using $1.5 million of its revenue from pot sales and fees to address its homeless issue. Money also is going to road improvements and a new recreation center. Adams County has earmarked more than $500,000 for scholarships for low-income students. Wheat Ridge keeps its revenue in the city’s general fund, and it’s used in a variety of areas. The same goes for Northglenn, where five marijuana stores generated $730,000 in 2015. The money will go toward water purchases and capital improvements to infrastructure and city facilities.